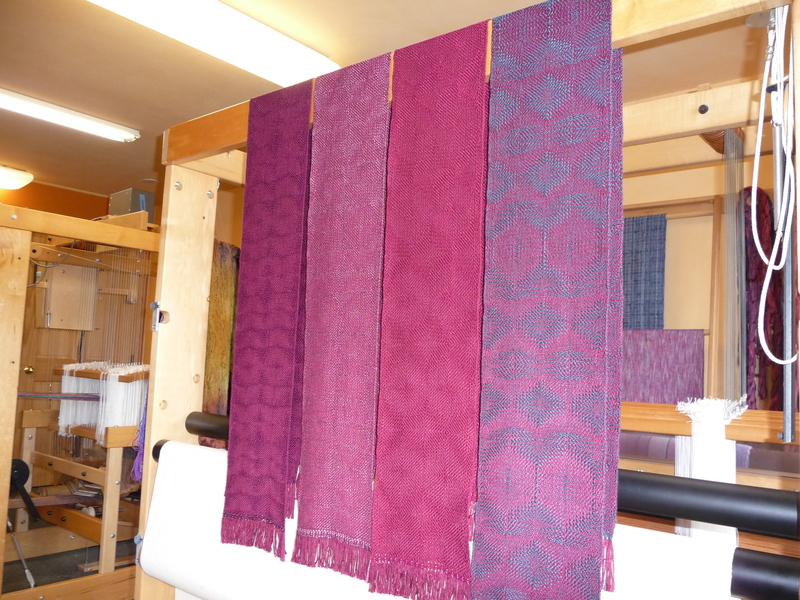 This is my snapshot of the four Merlot scarves, all done and ready for the REAL photographer. It’ll be interesting to compare this image with some of the ones he produces. That photo session took place yesterday, and it was once again amazing to me to see how great lighting and “posing” makes them look almost more wonderful than they actually are “in the flesh” as it were. The Fiesta warp is half woven, and will get another good bit of work addressed to it tomorrow. In the meantime, I’ve begun measuring the wide warp for a series of shawls, the first of which is a special order. Over 500 threads across, 8.75 yards long. A warm ecru bamboo yarn, soft and smooth and lustrous — the same yarn (different color) as in the Merlot scarves. It makes a marvelously drapey fabric which shimmers and shows the patterning beautifully. The next two warps for the Sally loom are planned and designed, and I’ll be getting one of them ready in the next few days so it can go onto the loom as soon as the Fiesta series is cut off. The practice of minimizing empty loom time is one of my most important work goals for this year; I’m expecting it to promote considerably more finished work this year. So I’m in the thick of this work, despite the daily necessity of commonplace tasks like cooking, spouse care, and maintaining a household. It reminds me of a long-ish quote I have hung over my work table, words of Georgia O’Keeffe about life and making art. I’ll copy that here sometime soon for all the world to enjoy. Having seen them in person, this photo does not do them justice. ( but it is nice to see the inside of your studio, here.) Can’t wait to see the “real” pics! Purty. Waiting for the “real” pics now.